PHOENIX — Like many talented underclassmen in the last several years, Purdue freshman forward Caleb Swanigan decided to test the NBA waters, declaring for June’s NBA Draft and working out for the Suns last week at Talking Stick Resort Arena. However, Swanigan will have a bit more time than those who came before him to decide if he should keep his name in the draft. Under an NCAA rule change approved in January, underclassmen have until Wednesday to return to college as long as they have not hired an agent, extending a deadline that last year was in late April. This year, players could participate in the NBA Draft Combine and work out for individual teams before deciding whether to stay in the draft or return to school. “I think there was great concern that in the past without enough time and information to make the best informed decision that underclassmen, who were prospects for the NBA, were making poor decisions,” said Dan Gavitt, NCAA vice president of men’s basketball championships. Gavitt said the idea for the change grew out of meetings with National Association of Basketball Coaches’ executive director Jim Haney, who put together a group of college coaches with underclassmen facing the challenges of the draft process, NBA Vice President of Basketball Operations Kiki VanDeWeghe and Ned Cohen, a former NBA executive who will join the Philadelphia 76ers’ front office next month. Gavitt said the decision to extend the deadline benefits student-athletes and their families because they are given six more weeks to explore the possibility of playing professional basketball while going through the NBA process and receiving feedback about their play. Swanigan earned Big Ten All-Freshman Team honors last season, scoring 10.2 points per game and pulling down 8.3 rebounds per game and setting a Purdue freshman record for the most rebounds and double-doubles in a season. Following his workout for the Suns, he said he appreciated the benefits of the deadline extension, including the fact that teams can get to know his game, so that if he does return to school, they can file that away for use in the future. “You’ve got that competitive advantage over people that don’t do it or before when you couldn’t,” he said. Gavitt said when he first started in college athletics it was unusual for underclassmen to go out after their first year, but he realizes that it is not the case anymore. He has a long history in college athletics and grew up around the sport. His father, Dave Gavitt, was the founder and first commissioner of the Big East Conference. “For better or worse, the game has evolved to a point where there are student-athletes who are interested in pursuing their dream of playing in the NBA and have that opportunity at a much younger age than they did a long time ago when I first got in the business,” Gavitt said. 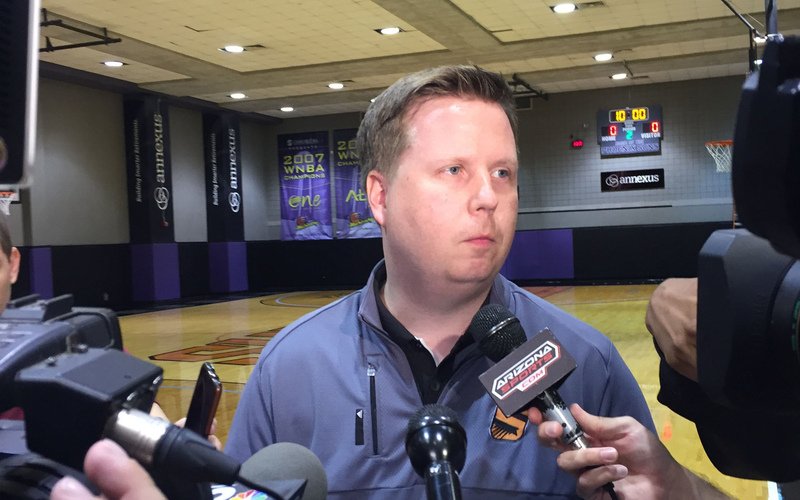 Suns assistant general manager Pat Connelly is one of the NBA executives playing the dual role of evaluating potential talent for his own team and providing feedback to underclassmen trying to decide whether they should return to college.